Before we begin: With gratitude to HaShem Yisbarach, I’m happy to announce the publication of Operation Inspiration, a compilation of some of the best Observant Jew columns with some new material added. Available at Feldheim.com or your favorite Jewish bookseller, its smaller size and soft cover make it the perfect companion to take with you on the road of life as you find inspiration wherever you go. Buy 2 or 3 – makes a great Chanukah gift! Now back to our column. When a friend sent me a video clip of a Jewish fellow sitting at a sporting event learning from a Sefer, I thought it was fantastic. It wasn’t the first time I’d seen something like this, but this one was special. It wasn’t a teenager or young adult filling in time between plays with an obligatory studying session, nor a dyed-in-the-wool sports fan catching up on the daily daf, though both of those are impressive in their own right. What happened here was that a man, well-past middle age, was engrossed in learning despite what was going on around him. So much so, in fact, that when the camera panned the crowd, this man stood out because he was a Jew who was not cheering that the Israeli soccer team scored a goal. 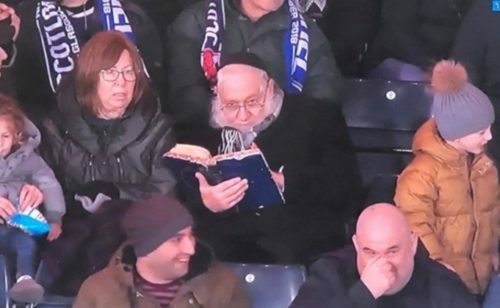 The announcers saw him peering into a book and commented, “That must be a good read!” assuming that some novel or biography captured the man’s attention more than the soccer game he was “watching.” He was on camera for several seconds before he unwittingly looked up, showing his face even more. It was none other than Rabbi Zev Leff, Rav of Moshav Matityahu and renowned speaker, teacher, and Talmid Chacham. I knew there had to be a back story and Baruch Hashem I met his son Yossi in a store shortly after I’d seen the video clip. He laughingly told me that he’d been sent the clip perhaps a hundred times. Then he told me the rest of the story. His sister and her husband live in Scotland and are involved in kiruv (Jewish outreach) there. When the Israeli team was coming to play their local team, it was an opportunity to get the university students with whom they’d been working excited for a “Jewish” experience. They had a big dinner at their home for the kids and then went to the game with group tickets to root for the Jewish athletes. Rabbi Leff and his wife were visiting and were asked to come along. His daughter said he wanted to go to spend time with his grandchildren, but also I’m sure he wanted the students to see that rabbis are people too, and being religious doesn’t mean you have to give up everything. It was a smart kiruv move if you ask me. So, by attending the game, Rabbi Leff wanted to make a Kiddush Hashem to those kids. 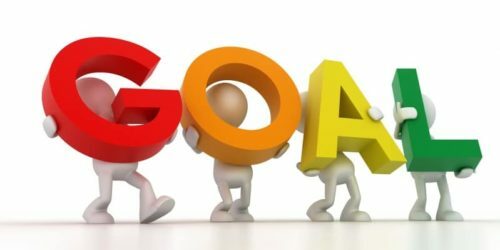 Hashem gave him the zechus of making an even bigger Kiddush Hashem, as tens of thousands of people saw that clip and saw a man more interested in Torah than in a sporting event going on around him. I’m reminded of a story I heard about R’ Shmuel Berenbaum z”l, Rosh Yeshiva of the Mirrer Yeshiva in Brooklyn. Once he was on a plane to Israel and the flight was diverted to Cypress. This was very exciting because the area in which they landed was veiled in secrecy. People on the plane peered out the windows trying to get a glimpse of some military secret or some hidden knowledge the outside world couldn’t get. Not R’ Shmuel. He didn’t lift his head from the Gemara he was studying. It was much more interesting in there. This is what Rabbi Leff achieved but with much more fanfare. He made the point that the excitement of this world pales in comparison to the joy and interest of understanding Hashem and His Torah. He showed that one can transcend the hubbub of life and find serenity and constancy regardless of where he is. There’s an old parable about a king who held a contest for the artist who could best convey “serenity.” Many came with pictures of glassy lakes glinting in the summer sun, snow-capped mountains standing like silent sentries, and similar pictures. One artist brought something quite different. His painting showed a violent thunderstorm with lightning streaking across the skies. Trees were blown and huge waves piled upon one another in the sea. Not finding this to convey serenity at all, the king asked the artist why he thought this fit the contest rules. The artist then pointed out to the king that amidst all the whirling wind and driving rain, in a small corner of the painting sat a mother eagle, perched on her nest in a craggy rock, quietly and confidently protecting her young. The king understood that serenity is not something you have when everything is fine. It’s what you need when everything is NOT fine, yet you maintain your composure. This painting won the prize. To me, Rabbi Leff had a goal of teaching others about the beauty of Judaism. Hashem arranged it so that just by doing what he believed in, he attained that goal, scored and won the match. Now THAT’S something worth cheering about. Did you enjoy this column? Feedback is welcome and appreciated. E-mail info@JewishSpeechWriter.com to share your thoughts. You never know when you may be the lamp that enlightens someone else.